There is a very good chance that you will have to change a flat tire sometime in your life if you haven’t already. Whether you drive a ’93 Geo Prizm or a brand new Lamborghini Hurucan, your tires are susceptible to popping. Every driver should know how to change a tire because there are pretty decent odds that most people will have to do it one time or another. Let’s take a look at the steps. Let’s go over the vital supplies and tools you will need before we explain the steps. Obviously, you will need a spare tire. Your car should have one in a compartment in the trunk, but if not, get one as soon as possible. Other essential items are a jack and lug wrench. These also should already be in your car. Some optional, but highly recommended supplies are a flashlight, gloves, wheel wedges, and flares. If possible, get your car to a parking lot or a quiet side street. You really don’t want to have to change a tire with dozens of other drivers passing by at 50 miles per hour. Turn on your hazards and get to as safe as a place as possible. Use the lug wrench, otherwise known as a tire iron, to loosen your flat tire’s lug nuts. Keep them loose but leave them in place. Move the jack under your car. Place it underneath the car’s frame and raise it until your flat is about six inches off of the ground. Now is when you can completely remove the loosened lug nuts. Grab the flat with both hands and slide it towards you. It should come off without much resistance. Take the spare tire and align it with the newly exposed lug bolts. Replace the lug nuts but do not tighten with the wrench until the car is lowered again. Carefully lower your jack until the spare tire is securely on the ground. Use the lug wrench to completely tighten the lug nuts. It’s important to tighten the lug nuts in the order of a star pattern so you don’t tighten ones that are immediately adjacent to each other. 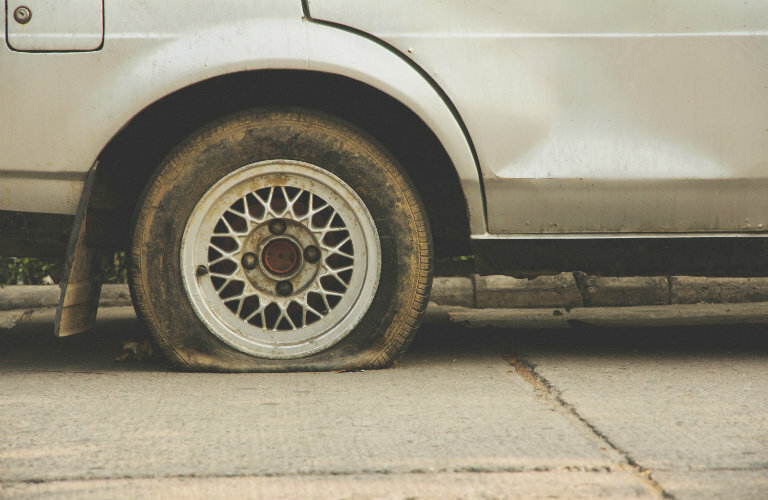 Replace the hubcap if you had to remove it and double check your spare’s tire pressure. That wasn’t so hard, was it? Stay safe on the roads!